For the full tour, hop-on at Stop 1 along the route, Gammel Strand/Stroget (Mermaid Tour and Christiania Tour) or Tivoli/Radisson Royal Hotel (Carlsberg Tour). However, customers can join the tour at any of the tour stops along the route. 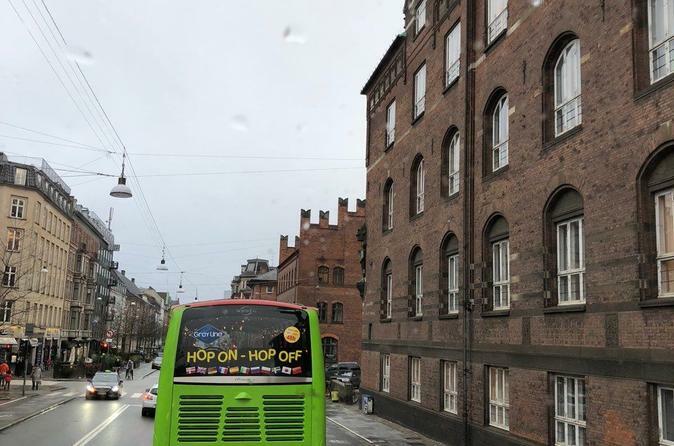 Select your desired hop-on hop-off tour from the two available — either the Mermaid Tour or the All Lines Tour with its three routes around Copenhagen — when you book. 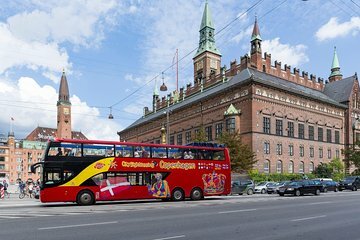 Then, when you’re in Denmark's capital, simply hop aboard the open-top, double-decker City Sightseeing bus and set off to explore the sights. Relax into your comfortable seat and listen to the entertaining onboard audio commentary as you travel around your chosen tour route. On the Mermaid Tour, choose to stay aboard for the roughly 1-hour loop, and drink in the 360-degree views of landmarks such as the Little Mermaid, the harbor statue inspired by the Hans Christian Andersen fairytale. Or hop on and hop off as you please at any of the stops to explore top Copenhagen attractions including the Amalienborg Palace, the winter home of the Danish royal family. On the All Lines Tour (May to September only), admire the views along the three, included city routes — the 1-hour loop of the Mermaid Tour route together with the 1-hour loop of the Carlsberg Tour route and 1-hour loop of the Christiania Tour route. Take snaps of the passing sights, such as the beautiful Little Mermaid statue and the Amalienborg Palace, and hop off at any of the stops along the three routes to discover the attractions on foot. Perhaps leave the bus at the Tivoli Gardens to spend time at this world-famous amusement park or step off at the Christiansborg Palace, the home of Denmark’s parliament, to take a guided tour of its lavish royal ceremonial rooms. Or maybe hop off at one of Copenhagen's prettiest buildings: Our Saviors Church, famous for its decorative helix spire with its winding staircase. These are just some of the things you can see and do on your hop-on hop-off tour. See the Itinerary for a full list of stops along the routes. I am rating this only for two stars because our experience was not as expected for a Hop on Hop off bus. First of all, the driver is the driver and at the same time the person that speaks on the microphone about a certain historical building or attraction. No announcement what channel we have to plug in our earphone to be able to hear the commentaries. We had to fiddle the buttons and find ourselves. Secondly commentaries were only made at certain buildings, attraction or area. Then it goes quiet for 3-10 mins. There should have been some sort of music for us to listen or some announcement that this is how it works. Been to many hop on hop off sightseeing bus this one in Copenhagen was the worst one. To make a difference or to make it better, there should have been two employee on the sightseeing bus. The driver and the person that guides and make announcements or commentaries and can speak very good English. Great way to see the city have to get an early start. Services should go until at least 7-8pm in May, June and July. Great way to see Copenhagen! The hop on and hop off option is always good specially if you want the flexibility to explore the sights and have easy transportation around the key spots. Since it was a rainy and very cold day, it was very nice to be able to just go around the city inside the warm bus. The recorded narratives were helpful and humorous. It was a nice way to see the city when you just have one day. we went in Jan, and did not get told when booking that two of the three tours only run on Fridays and Saturdays, and as it is winter the tours are once every two hours-so there was a lot of waiting round in the very cold. buses were not on time and when we asked staff about it they simply replied that it was winter! also the Tivoli gardens is not open in winter. prices in the city for food and drink are very expensive, and the service in bars/restaurants is poor-if you want water at your table then you have to pay extra for it. a lovely city but don't go in winter, the city was dead after about 6pm , all shops closed and no people on the streets or in bars-it was alittle like a ghost town! Interesting tour. Savannah is apparantly a haunted city. This tour comparable to other haunted tours I have taken in other cities. This was our first experience ever doing a hop-on hop-off tour and unfortunately we did it near the end of our time in Copenhagen. It is MUCH better to do something like this near the beginning of your trip so you have an idea of what attractions you'd like to see again before you leave. The speaker tour guide was clear and we learned a lot about the city's sights. Would definitely recommend to anyone! Great overview of the city.